I have a confession to make...I rarely cook breakfast for my family. Most mornings it's cereal, pop-tarts, pancakes, toast, microwave sausage sandwiches ...something easy. Mornings are so hectic and cooking breakfast just adds to the chaos. So, when Gooseberry Patch gave me a copy of Slow-Cooker Fall Favorites and I saw this recipe for Bacon and Cheese Breakfast Casserole that you can make in the CROCKPOT the night before, I knew I wanted to try it! I made it on a Saturday night so we could enjoy it on Sunday morning and everyone liked it. B was a little skeptical at first and asked for Honey Nut Cheerios, but she finally gave in and said she liked it and even cleaned her plate! So, if mornings are chaotic at your house also, I highly suggest making this recipe for your family! Heat oil in a skillet over medium heat. Saute onion in oil until translucent. Stir in hashbrowns and cook until golden. 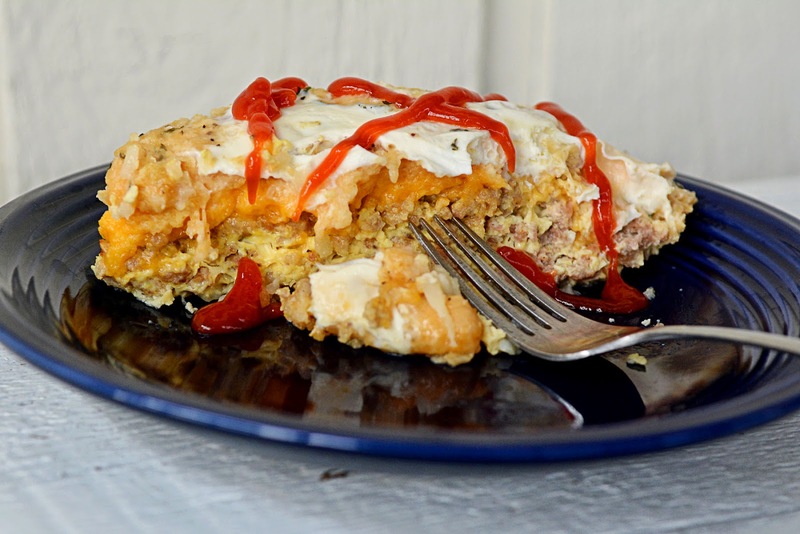 Place the hashbrowns in a lightly greased slow cooker. Top hashbrown mixture with green pepper, bacon and cheeses; set aside. In a bowl, beat together eggs, milk, parsley, mustard, salt and pepper. Pour egg mixture over cheese in slow cooker. Cover and cook on low setting for 5 to 6 hours, until a knife tip test clean. Sprinkle a little extra cheese on servings, if desired.